Home > Room Scenes > Period Style Oak Dining Furniture in Traditional Interiors > Bulbous 6 leg oak dining table in converted Suffolk barn. Bulbous 6 leg oak dining table in converted Suffolk barn. 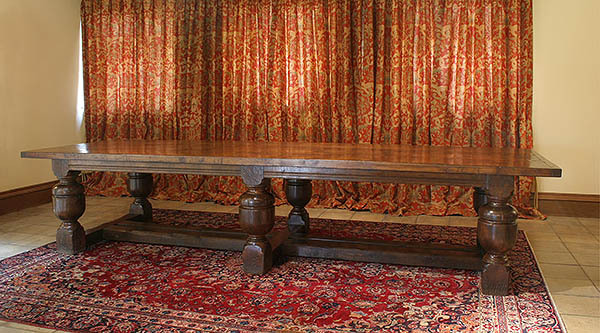 Long custom made 10-seater refectory table, with bulbous Elizabethan cup and cover style turned legs, 6 in total with twin centre stretchers. Photographed in the dining hall of our clients converted Suffolk barn.